Thanks, Anna, for including me in the Spice Up Your Kitchen fun! You are one amazingly talented lady with superhuman inspiration and time management skills. 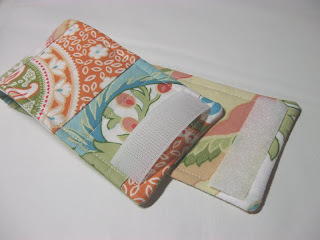 Because I'm always looking for ways to create and simplify, I've got a tutorial for quilted canister sleeves. 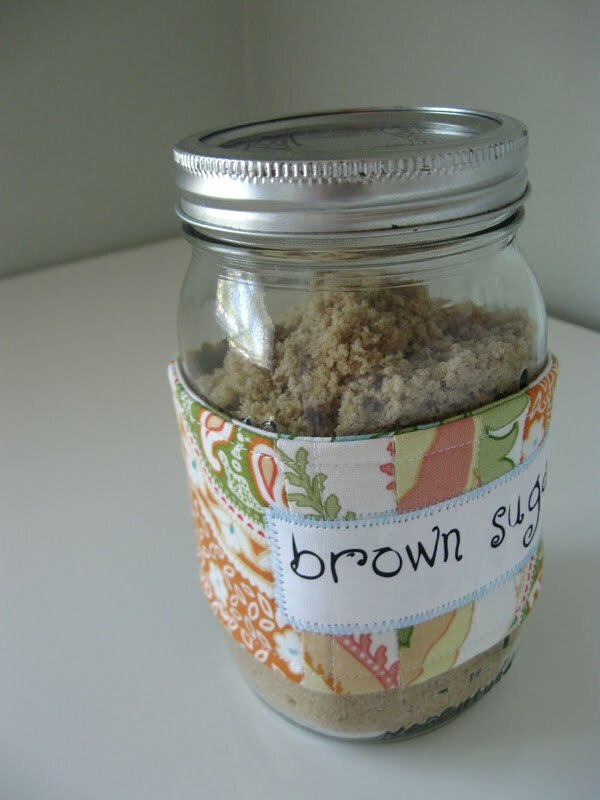 they would look just as good on plastic containers or even mason jars. Like I mentioned over at Noodlehead, I don't always enjoy cooking all that much but I always like a reason to sew and turn something practical into something beautiful. So these little sleeves were conceived. And I am definitely more likely to cook in a well organized kitchen filled with beautiful things to inspire me. 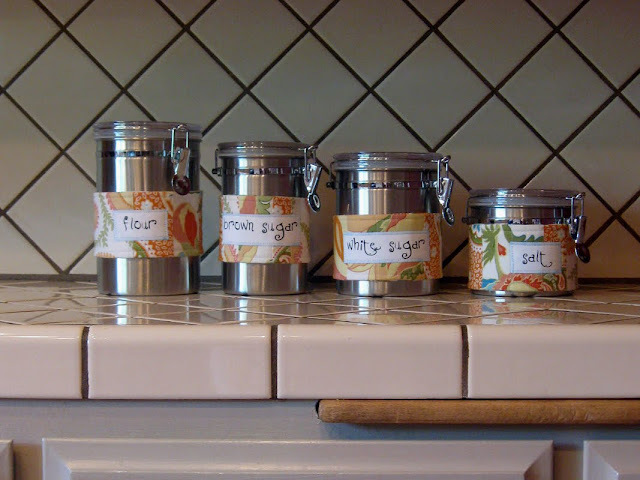 Now my pantry essentials are not only stored tidily but they're awfully nice to look at on the counter. You'll need a variety of fabrics that you want to look at on your counter every day (mine are Charisma by Gail Kessler for Andover Fabrics), quilt batting, velcro (I used 3/4" but any width would do), rotary cutter, printable fabric (I used the sew-on kind, but you could easily use the iron-on type in the picture), and a denim needle for sewing the velcro. 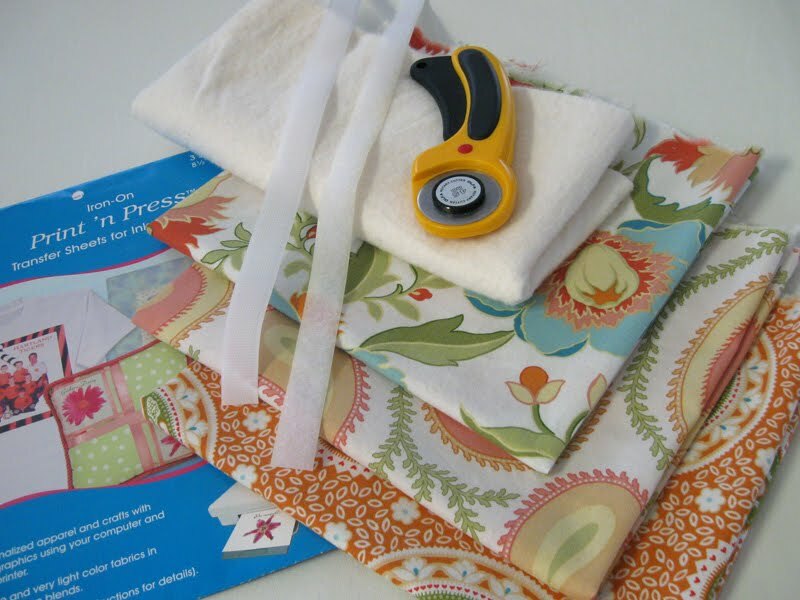 Oh, and it will make your project easier if you prewash and iron your fabric before starting. 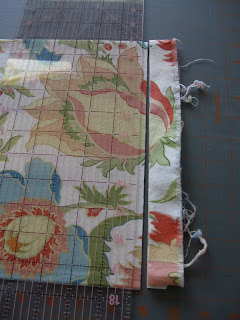 Using my rotary cutter and ruler, I trimmed off the raw edge. 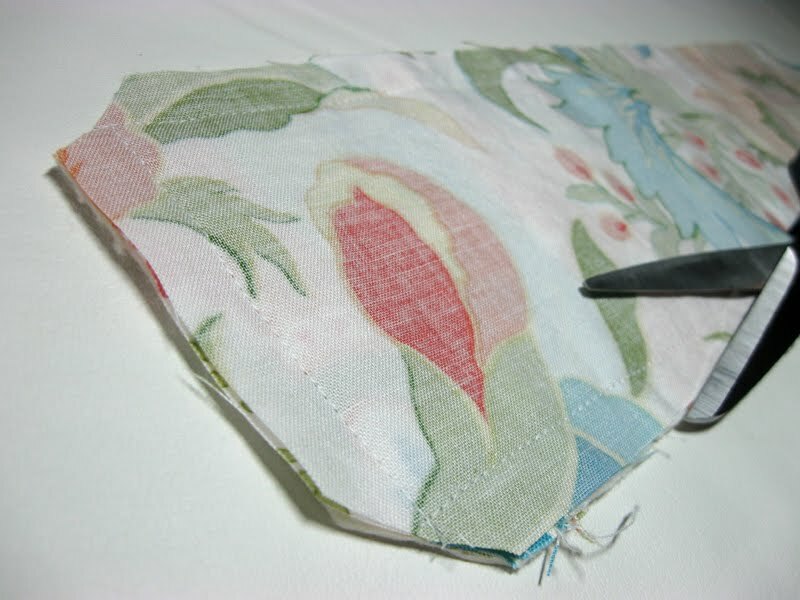 Measuring 4" from the newly cut edge, I cut through all layers of the folded fabric. Your strip will look like this. 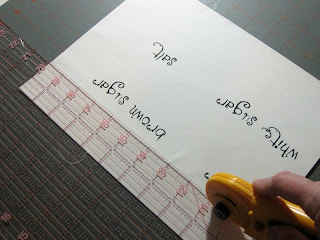 Repeat for all your prints so you have a long strip of each print. Now cut each strip into pieces of various widths. Mine range from 1 1/2" to 4 1/2". so don't make your widths too thin. And now you get to arrange them how you want. 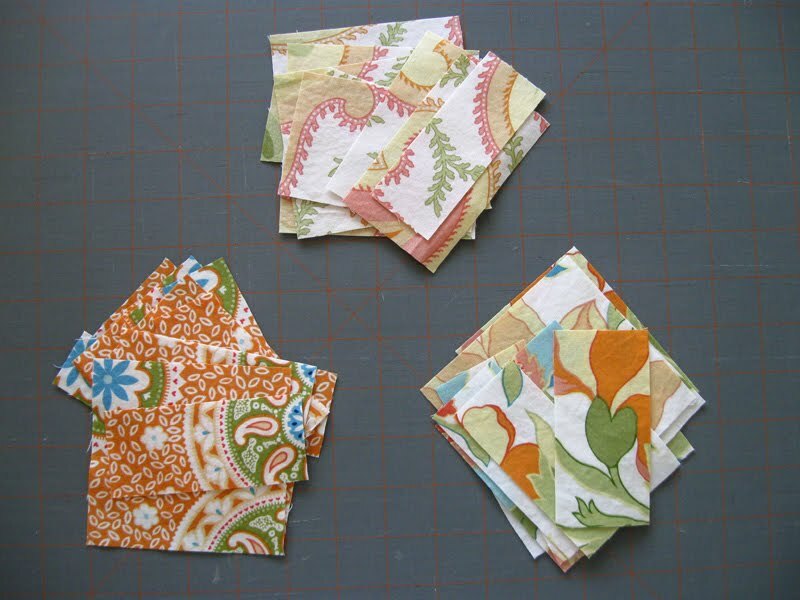 Decide how you want the pieces to match up and stack them in that order. 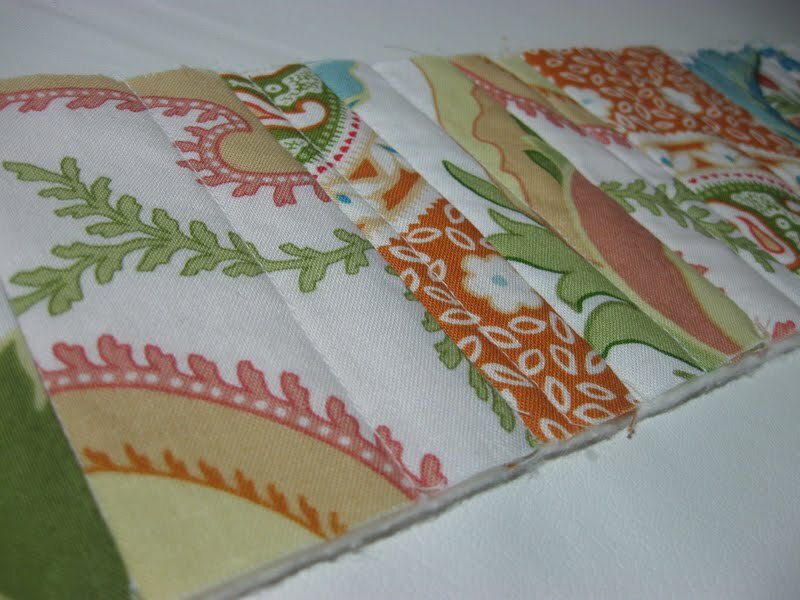 Using a 1/4" seam allowance, sew all your pieces into a long strip, just like piecing a quilt. The finished length of this strip depends on how big around your containers are. Each container will need a strip 2 inches longer than its circumference. For example, my canisters measured 15", 15", 15" and 12.5". 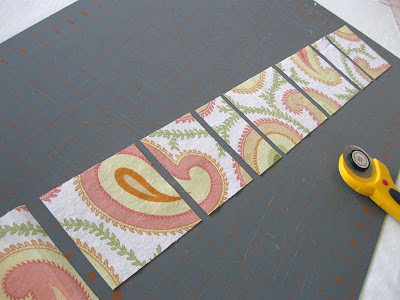 The strips for each canister will need to be 17", 17", 17" and 14.5". 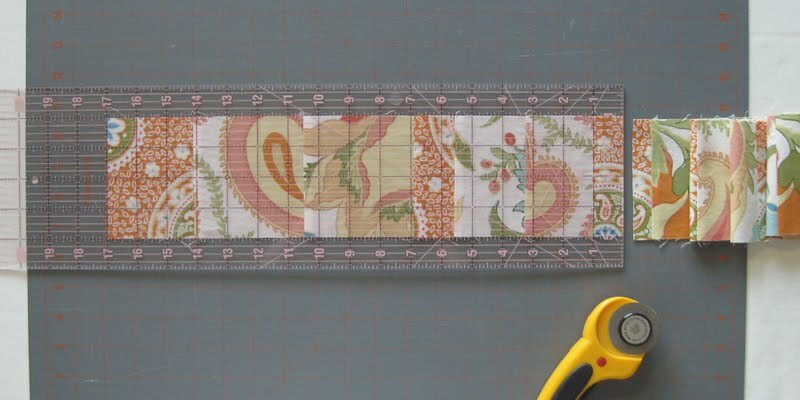 This continuous strip then measured 65.5" (the combined total of my four). 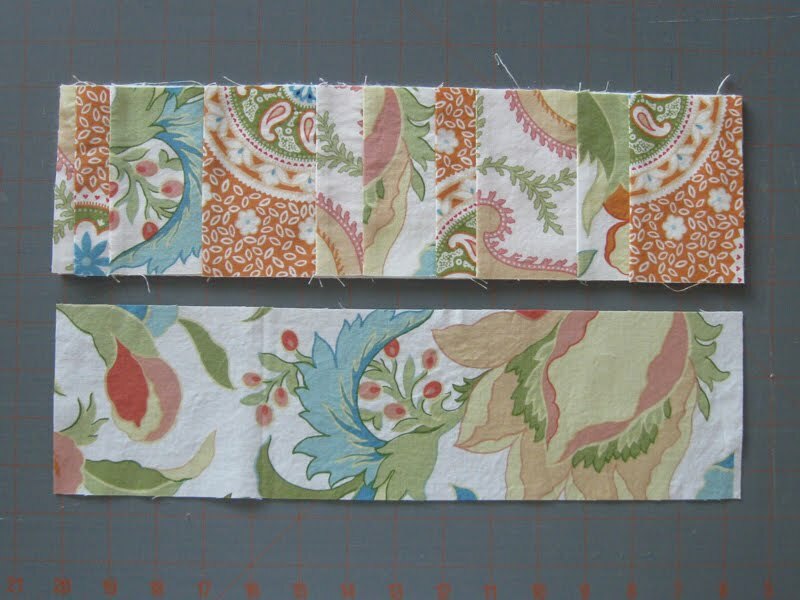 Just keep joining pieces until you get at least the length you calculated above. Press all your seams to one side. 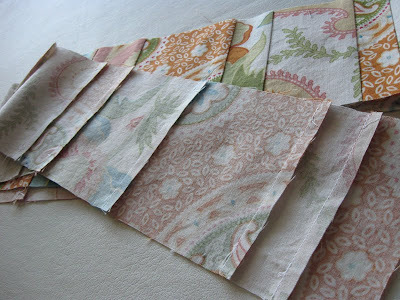 Now cut the correct lengths for each canister (I'll call these the sleeve fronts). Again, these will be 2" longer than than the actual circumference of each container. 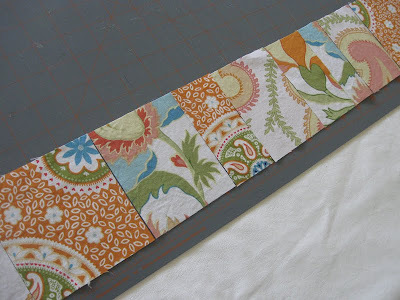 Cut a 4" strip of batting to match the length of each sleeve front. 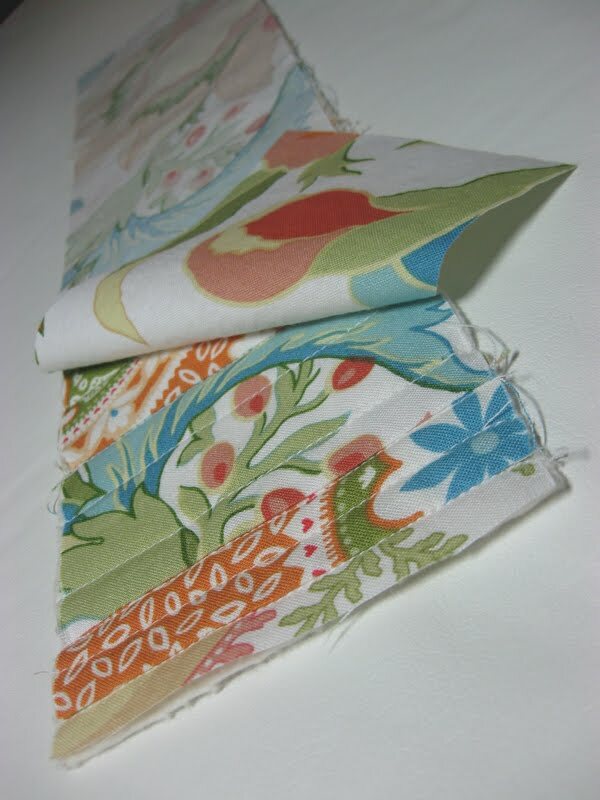 And cut a 4" strip of fabric in this same length to back the sleeve (I'll call these sleeve backs). Pin your batting to the wrong side of your sleeve front. Stitch in the ditch (shown below) to secure the batting. 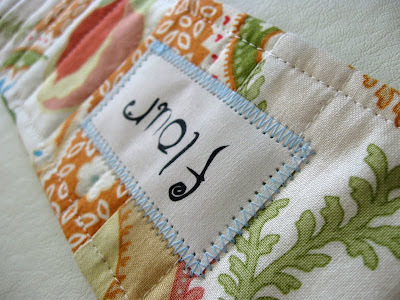 Then add some random vertical/parallel stitches to hold it in place and make it even cuter. 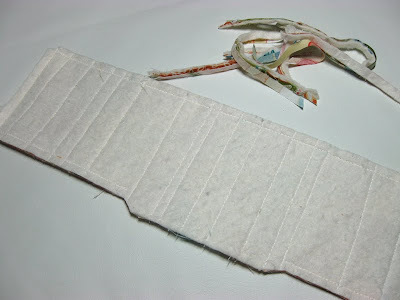 Your batting and sleeve front will look like this when they're sewed together. 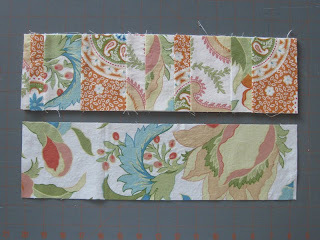 Now line up your sleeve front with the sleeve back, right sides together. 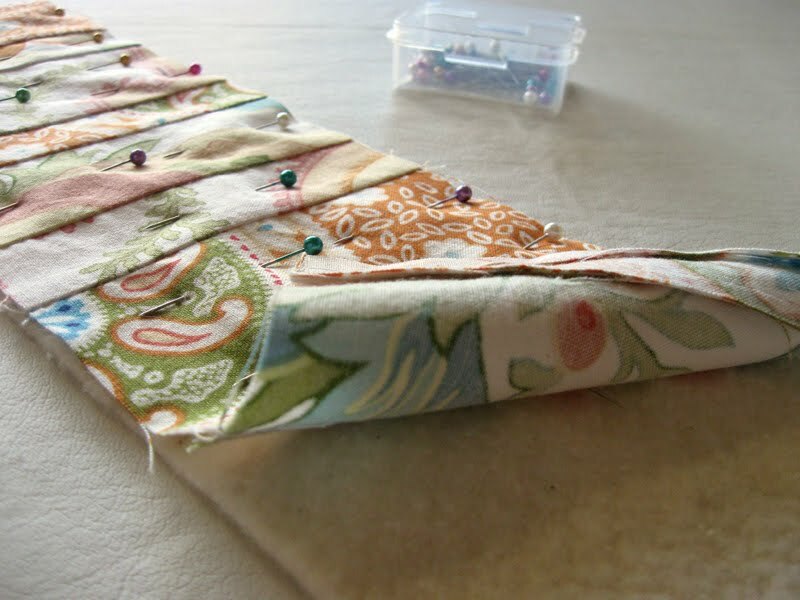 Pin all the way around and mark a 4" opening for turning in the center of one of the long edges. 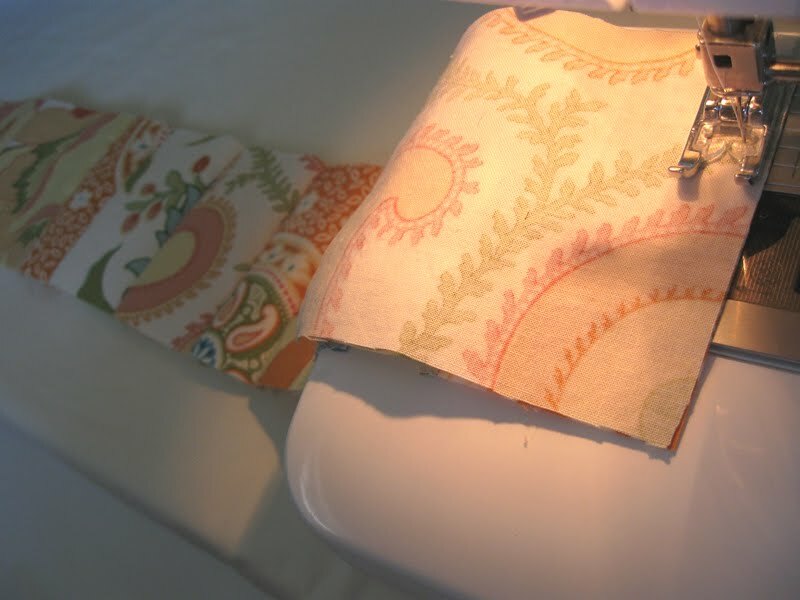 Sew the sleeve front and sleeve back together using a 1/2" seam allowance. 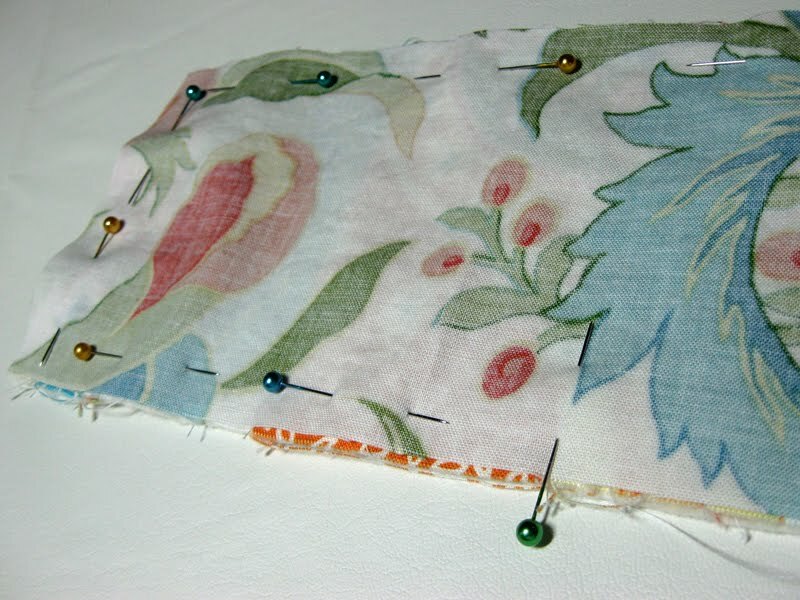 Make sure to backstitch at the start and finish to reinforce the 4" opening you left. 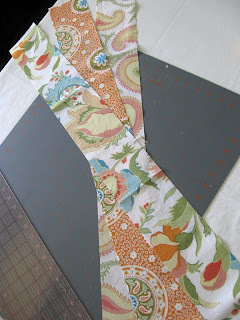 Clip your corners on the diagonal. 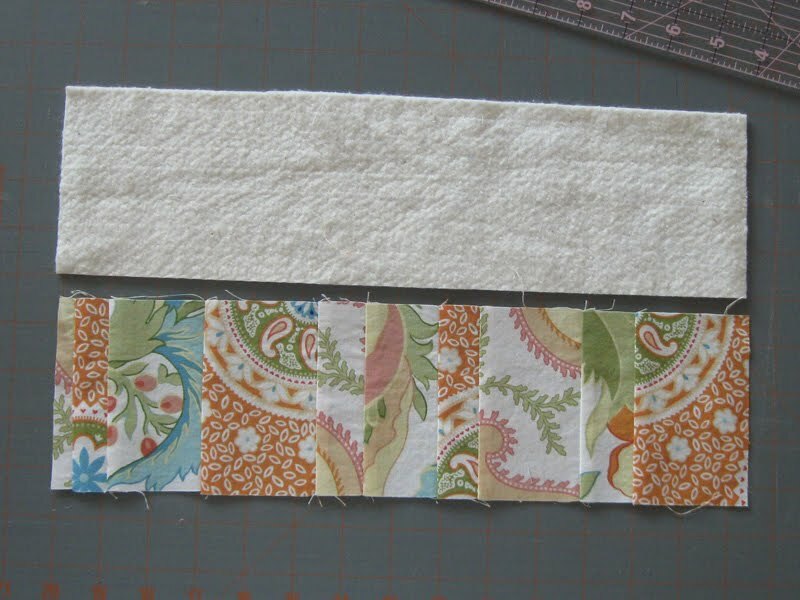 Trim your seam allowance to 1/4" (just trim away half) all the way around except for your 4" opening. Leave this at 1/2" and angle the edges like the picture below. Now turn, push out your corners, and press flat. Topstitch all the way around about 1/4" from the edge, or as close as you can comfortably get. 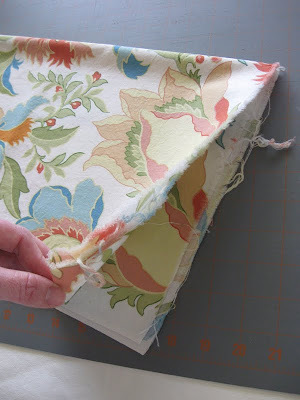 Cut your velcro to fit either end of the sleeve. 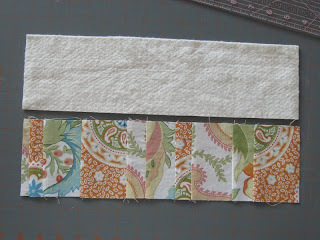 One hook (rough) piece on the inner side and one loop (soft) piece on the outer quilted side. Stitch them in place using a denim needle to help you avoid skipped stitches through the velcro. Look at how nicely that comes together! Now you get to print those labels and cut them to your desired size. 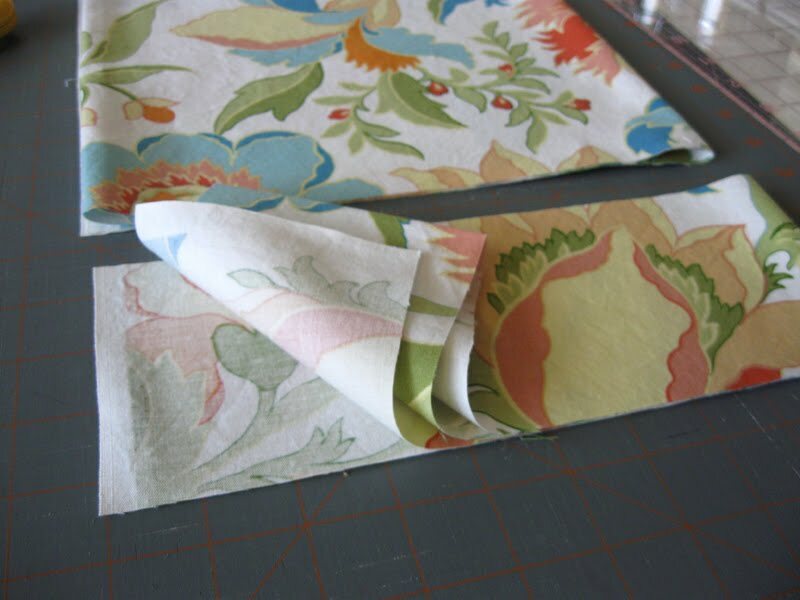 Important: follow packaging directions carefully for the printable fabric! You can, of course, use any font, size, style, etc. That's the beauty of handmade! But if you like the size and style of mine, here's a pdf template. you'll need to mirror the image in your printer properties at the time you print (easy to do, I promise). 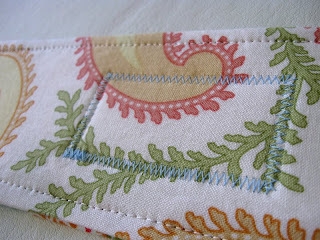 Using a tight zig-zag stitch, secure the label to the sleeve in the center. The back of the sleeve after putting the label on. Now you have a whole set of beautiful handmade labels. 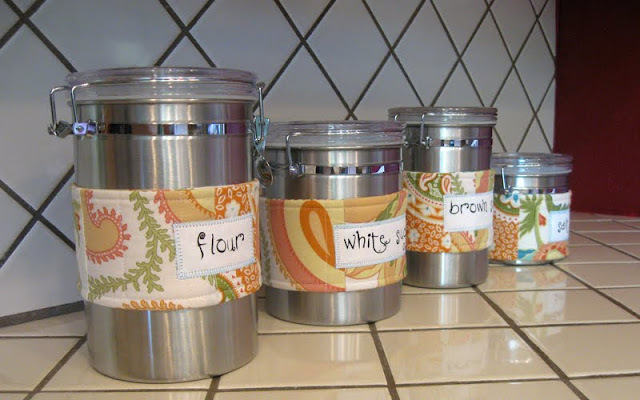 Now wrap your canisters/containers/jars nice and snug and put them on display. Isn't that a lovely sight on your countertop? If you use this tutorial, I'd love to see your creation! These are gorgeous. I never ever would have thought of this so thanks for sharing! 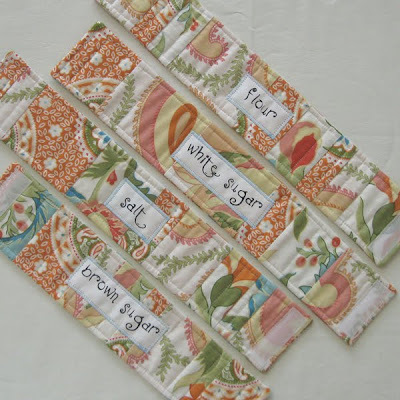 this is such a great way to add some color to your kitchen. thanks for sharing. What a lovely way to spice up the kitchen. Thanks for the tute. This is so beautiful! I love it. I'm a new follower! I just love this! What an awesomely cute idea! Thanks for sharing this tutorial with us. And thanks for the great tip about using a denim needle with the velcro. 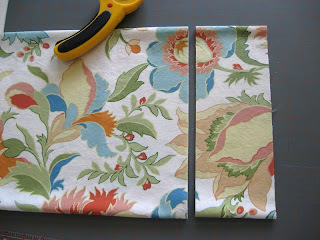 I'd never thought to do that, and it will help with some many projects. Hi! 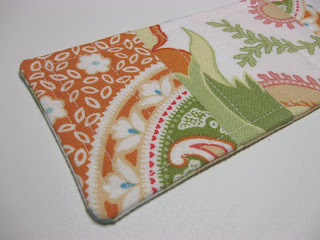 I am a new follower here and I am loving our blog! I am new to sewing and just got my first machine ever for Valentine's Day. yep that is what I asked for. Anyway, i have been looking at online tutorials and yours are so well explained with lots of pictures. Great job with them. I had no idea what stitching in the ditch meant either but had seen it so many places and you showed a pic. it is what I would have thought but needed to know for sure. I feel like I just started to crochet again as there is a language for sewing like any craft. it takes a while to understand the lingo. these are gorgeous! and so original! love them. Those look fabulous! Just came over from Noodlehead and look forward to checking out your blog. Thanks! These are just too cute!! 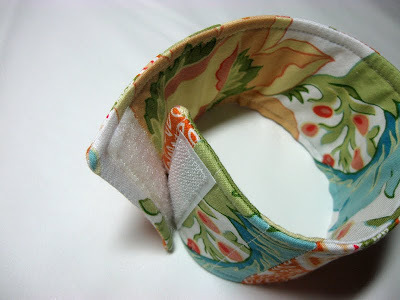 I don't know how you come up with these ideas but they make me want to get a sewing machine, and get over my fear! Kar! Congrats on your feature!!! :) You are amazing and these are beautiful. Another great idea, Kari. I might use this to spice up some not-so-fantastic green glass canisters we use in our kitchen. Would also be a good jumping off point for me as I have never attempted any quilting projects yet. BTW-it's not geeky to be excited about being proud of yourself...just be proud and say, "Look what I created!". SOOO Cute. Love, love, love the fabrics! Adorable! 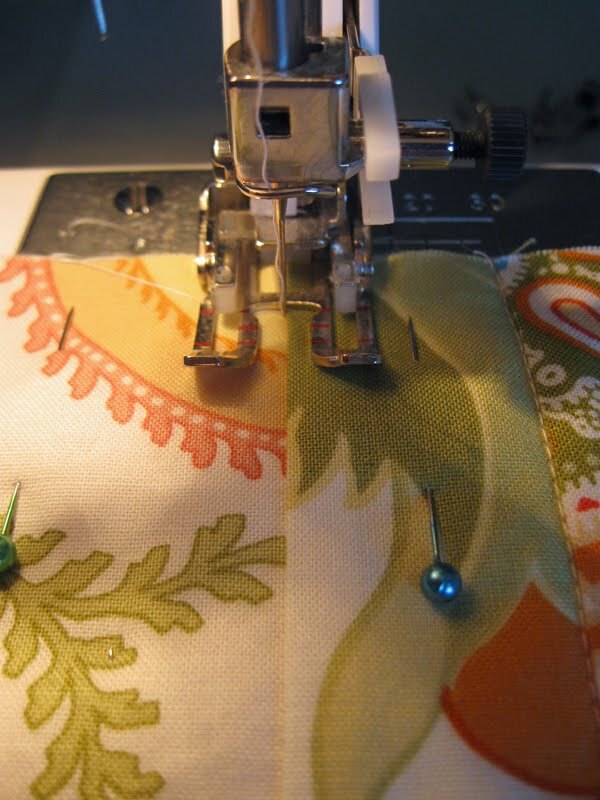 I need a ton of these in my sewing room! I am forever popping open containers searching for my supplies. What a pretty way to be organized. Thanks! I'll be linking on Facebook. I really love this idea. Thanks for sharing! Found ur blog from Noodlehead. :) I will definitely visit you again. wow this is a great use of my Charisma collection! Makes me want to get up and sew! Keep it coming! I was really inspired and impressed with your great work! I just love your tutorial and it's very awesome. How I wish I could personally touched some of this work for my own. I really love it!